Today he is known as one of America’s greatest presidents. But what about the many interesting facets that made up Abraham Lincoln’s repertoire in the 1800s? Needless to say, the 16th president was a very interesting person! At an impressive height of 6’ 4”, Abraham Lincoln was and still is the tallest president in U.S. history, barely beating Lyndon B. Johnson at 6’ 3.5”. He wasn’t given a middle name when he was born. He went through his life with only two names and reportedly preferred to be called Lincoln over Abraham. Our 16th president kept goats, amongst many other animals, at the White House. His sons, Tad and Willie, often played with the goats on the lawn and named them Nanny and Nanko. Nanny was known to sleep in Tad’s bed at night. Read more about the Lincolns’ love for their goats here. Lincoln is honored in the Wrestling Hall of Fame. Yep, you read that right — he became an accomplished wrestler as a young man, defeated only one time in approximately 300 matches! 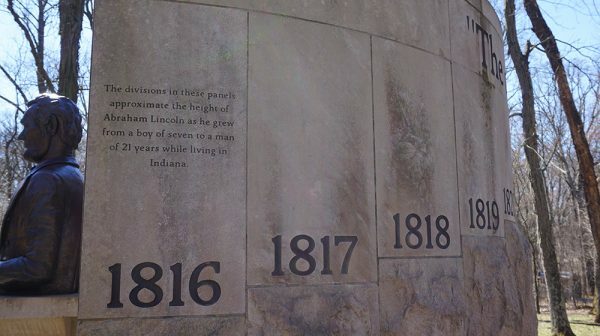 Abe didn’t move to Illinois until he was 21 years old. It was here in Spencer County, Indiana, where he spent his formative years, growing from childhood to manhood and going on to become known as one of the world’s most respected leaders. It was here that many of his character and moral traits were formed and nurtured. John Wilkes Booth’s brother saved the life of Lincoln’s son (say that five times fast!). If you’re unfamiliar with the history of Lincoln, John Wilkes Booth is the man responsible for the assassination of Abraham Lincoln. A few months before his assassination, the president’s oldest son, Robert Todd Lincoln, was accidentally pushed onto the tracks in front of a moving train by a throng of hurried passengers. The hand that reached out and pulled the president’s son to safety by his coat collar was actor Edwin Booth, brother of John Wilkes. What a small world! 9. Despite having a successful law career, Lincoln did not receive a college or law degree. 10. Lincoln’s cat, Tabby, was known to eat at the White House dinner table. Interested in learning more about the history of Abraham Lincoln, the people that surrounded him, and the area that shaped him? Then planning a trip to explore the various sites and attractions throughout Lincoln’s Indiana Boyhood Home sounds right up your alley! Use our “My Trip Planner” tool to make planning your trip easier than ever. Originally Published on July 6, 2017.